I recently spent two weeks in South Africa working alongside the organisation Ten Thousand Homes, along with a group from my church. Since I've returned I've been trying to untangle the jumble of thoughts, emotions, experiences and memories I came back with, so here's my first attempt. 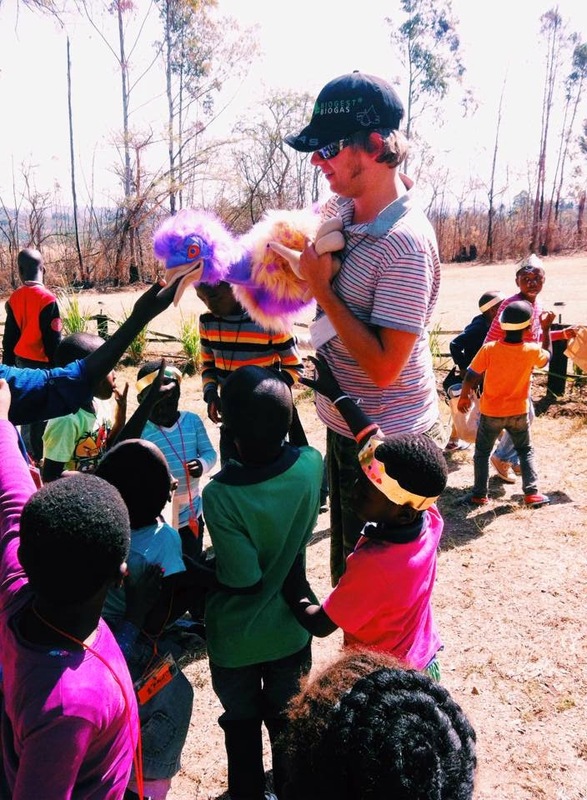 The team at Ten Thousand Homes (TTH) describe themselves as "a movement of ordinary people building hope and creating homes for Africa's orphaned and vulnerable children". They're based in White River, South Africa, beneath the watchful eye of the distant Drakensberg mountains and surrounded by fast-growing eucalyptus plantations. Day and night coal trucks rumble past on the nearby arterial roads en route to Mozambique and Zimbabwe, adding to the soundtrack of birds, insects and other fauna which accompanies their extraordinary work in the local communities. Our trip coincided with the end of the dry season, and the land bore the charred scars of recent bushfires which had reached ominously close to the TTH base. The charity was deservedly included in a recent Huffington Post article with a list of 100 charities doing good around the world. It's been running for over a decade, and started in response to the orphan crisis as a result of the HIV-Aids epidemic. Initially building actual houses for child-headed households, TTH has also sought to create "home" in a variety of ways which now include numerous after school programmes and other activities. Whilst still a major issue, the orphan crisis picture has changed over time, with many of these orphans now grown up and with children of their own, something TTH have also adapted to by purchasing land in 2008 to create a "university village" providing training in vocational and other life skills. What's their model? Well, as team member Jeremy Price told me "Our model is that we have no model.. it's relational" - and for me, this is one of the things that sets the work of this group of ordinary people apart. If you're anything like me, you may have an overwhelming desire to fix things that are broken. This may just be a man thing (men being from Mars after all), but I've observed this attitude at every level right up to Government in our modern Western democracies. The challenge I set myself as I embarked on this trip was to put aside my need to fix things and instead allow myself to learn from the experience and assist the broader work of TTH in any small way I could. If I'm honest I wasn't sure what this might look like or what my contributions might be, although I hoped that this might include some building work and anticipated that we would help with some of the after school programmes. 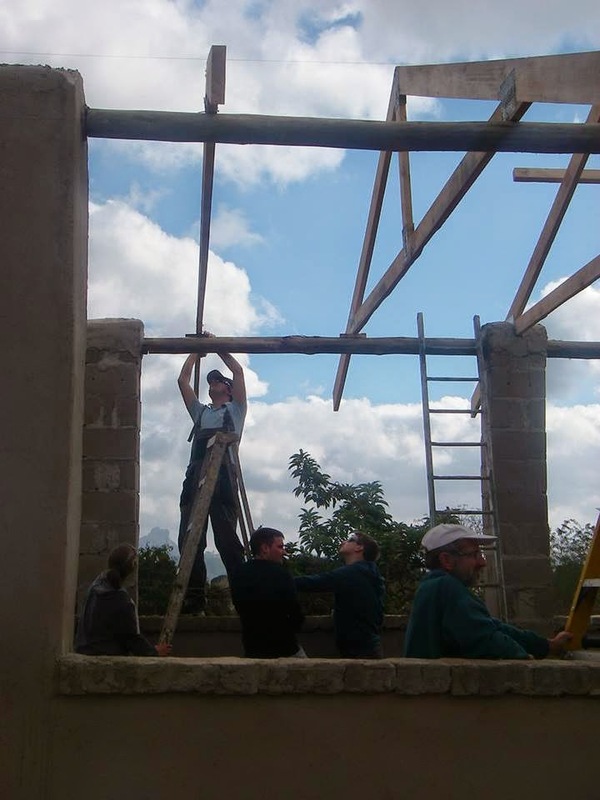 Spacing the roof trusses in my dungarees! I was delighted that we were able to contribute to building a roof for a community pavilion, erecting the trusses, purlins, bracing etc in preparation for the corrugated metal roof sheets. I'd even brought out my workshop dungarees in anticipation of doing something with my hands, so when we had the opportunity to assist the building team on our first day I was straight in the back of the bakkie and up the ladder to help. Although the corrugated sheeting wasn't available until after we left due to the lingering effects of a metalworkers' strike earlier in the year, we left having completed the full roof frame - alongside the TTH team which included chaps from the local community. From the top of the roof the views are stunning of the surrounding hills and distant mountains, but one TTH team member shared with me a conversation they'd had on this topic with those living in the community, who had said "we don't see the scenery, we just see the poverty". Interesting the differences in what we see - what do we miss in the scenery of our own lives? Much of the work we were able to contribute to was in various after school programmes in three nearby communities. These generally involved a meal for the children (usually something like offal with pap - the local maize staple - and some orange), playing with them and giving them a safe environment just to be children. We sang fun action songs with them, told stories with simple visual effects - even throwing in some handkerchief and rope sleight of hand which left the interpreters momentarily speechless! A highlight was putting on a "Day of Royalty" in which some 450 local kids were bussed onto the TTH campus for a day of being treated like princes and princesses - cue epic craft stations, dressing up, singing songs in an empty swimming pool (good acoustics), bouncy castles (bounce houses in the local lingo), treasure hunts, and a giant picnic. Truly a day to remember all round, and whilst exhausting, a lavish expression of God's love for each and every child that came. Being puppet-man on the Day of Royalty.. Probably what I found hardest of all were the two trips I took to the children's ward at the local hospital - not because of the standard of care or quality of facilities, as these turned out to be very good - but instead due to the feelings of powelessness it evoked in me. On the day I visited there were around 30 children in the ward, with very little to play with and all missing their parents - visiting hours being very restricted. Many of the injuries, burns and missing digits were as a result of car accidents, symptomatic of a broader traffic safety issue and and indication that things are rarely as simple as we think. In these moments of helplessness I was reminded of a quote by Mother Theresa: "Not all of us can do great things, but we can do small things with great love". For me, the small things included playing rock, paper, scissors, or double-double this-this, or simply keeping them company - not life-changing actions in themselves, but things which brought smiles to little faces and which at least hopefully brightened up or changed their day. Clearly our presence wasn't the same as having their parents or loved ones there, but as a parent myself, I'd be grateful to anyone who tried to brighten up my child's day in hospital, in however small a way. Towards the end of our time we had the opportunity to assist in what turned out to be a profound and remarkable act of love. A couple who had been the recipients of a new home built by TTH had identified a lady in dire need of a safe place to live, with a simply heartbreaking backstory, whose baby had died suddenly. The wonderful thing was that in gratitude for the blessing of a home they'd received, they wanted to build a temporary home for this lady on their own plot - a place of refuge and safety. Kacy tells this story eloquently on her blog. So while the craziness of the Day of Royalty was going on, the TTH team set the wheels in motion so that a few days later, alongside the local community, we had the privilege of building a simple house. Simple for us, life changing for her, and her son. All brought about through the relationship this movement of ordinary people have built with the communities around them. As I've reflected on our brief time with Ten Thousand Homes, one of the things I've most appreciated about their attitude is the desire to help the communities to develop from within. Calling out the best in them - and don't we all need people around us to call us and challenge us to be the best expression of who God's made us to be? TTH are into organic growth, not imposed models. 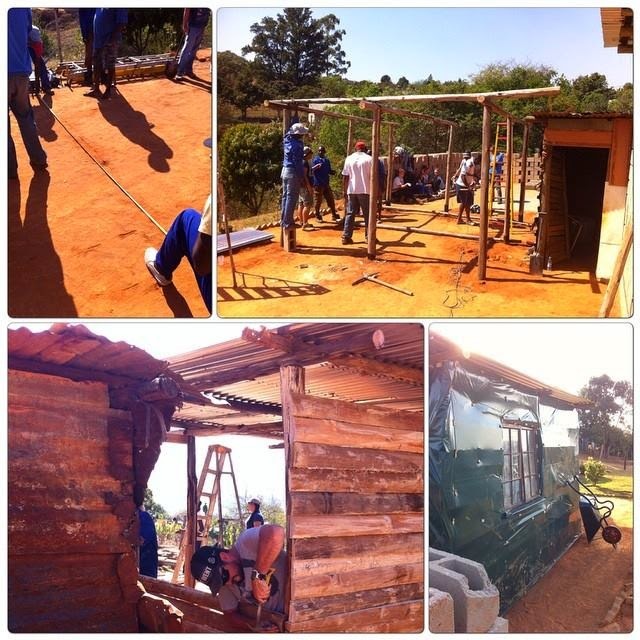 Like the story of the temporary home, this is change from within - initiated by the communities that TTH are serving. On our short visit we were only able to do small things. But if you can repeatedly change a person's day enough times you can end up changing their life. TTH have a motto plastered on their office building "To Change a Nation, Love the Children".. they continue to invest in the children and young people of the area, day in day out. An investment in the future of South Africa. And like any good investment, slow and steady accumulation is the most effective means. We left the communities on the Friday to travel home. By the Monday they'd erupted into violent protests and rioting over problems with the Government-supplied water deliveries. Testament to the fragility of these community ecosystems and the need for holistic systems-thinking as a means to change rather than lurching from crisis fix to crisis fix. Jen Price, another TTH member wrote a moving piece on this situation earlier this week. It's too easy to impose "western" eyes on to world situations, but I think we serve ourselves better when we instead allow ourselves to be challenged about what authentic Christian expression looks like where we are. In this respect it's helpful to be out of our own context for a while to give us fresh eyes to see our own scenery again, and recognise our own cultural quirks and idiosyncrasies. "To change a nation love the children". We couldn't change such a rich and complex situation in two weeks, nor did we intend to. However, I'm proud of the numerous and wonderful small things we contributed to and carried out with great love. Big enough things to change someone's day. Change enough days and you impact the course of a life. Change enough lives and you change a community. Change enough communities and you change a nation. This is the extraordinary work being done by the ordinary people at TTH, and I'm proud to have played a small part in this. But they are a formidable force for good - the change may not be occurring as quickly or as visibly as in the surrounding eucalyptus plantations, but it's growing strongly and steadily, just watch and see. Thanks for writing this, Luke! It's super encouraging! So glad you were able to come and be a part of the change by hands on love. Thanks so much for your investment. You don't know me, but thanks for sharing - I got this through a Facebook share from Luke Adams (who I don't know that we'll either - just from him playing his music at the Upper Rooms, lakeside church). This is beautifully written, I thought I was there. And such a wonderful mission statement they have - to change a nation, love the children........so true! Thank u. Thanks Jen, really appreciated being part of what you're doing. And thanks to the anonymous poster too - very kind and encouraging words.